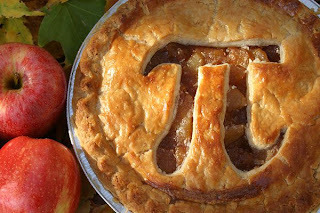 “Pi Pie” courtesy of no-frills marilyn. The week started with snow and is ending in sunshine, crocus sightings and a Saturday of Pi(e). In celebration of 3.14, I’m creating some self-referential charts using Google Docs, which allows the easy and free creation of documents, spreadsheets and presentations online. I thought I’d check it out after my husband mentioned it in preparation for last weekend’s Nevada Interactive Media Summit, where he gave the rockin’ presentation “Data-Driven Web Publishing (without a programmer).” Check it out here. Aaaanyway, I’m also not going to let March 14th pass without a big piece of pie, or at least a close approximation to one. I’ve been drooling over pictures of a dark chocolate tart with gingersnap crust, and now I’ve got a reason to make it. But we can make some pie together if you participate in my short survey, and come Monday, I’ll post those glorious charts. Thanks for participating, and don’t let Saturday slip by without a piece of pie! Next post: Oh my, we love pie!